After 20 minutes I had grabbed one from my towns argos and started the teardown process. First step was to look at what we got for our £20. 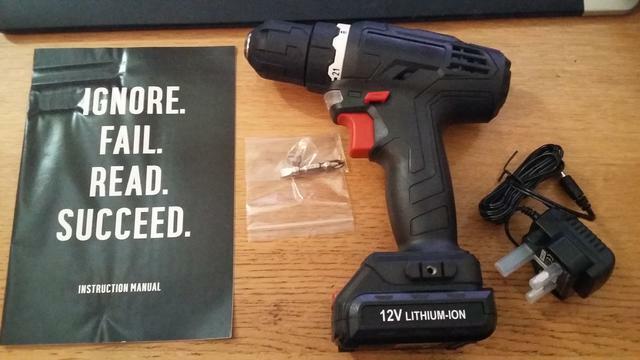 Provided is the drill, charging power supply 15v 330mah (Note I don't say charger, I'll get to that), screwdriver bit and a passive aggressive instruction manual. Initial impression of the quality of the drill was actually quite good. In a twist to most of my life I actually opened the instruction manual, inside I pleasantly found a spec sheet. 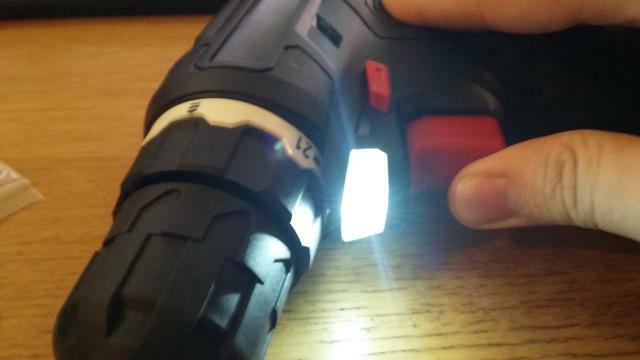 A neat feature is a small light that comes on when you press the trigger. The trigger is proportional here rather than the on/off of before, not much resolution at the low end. 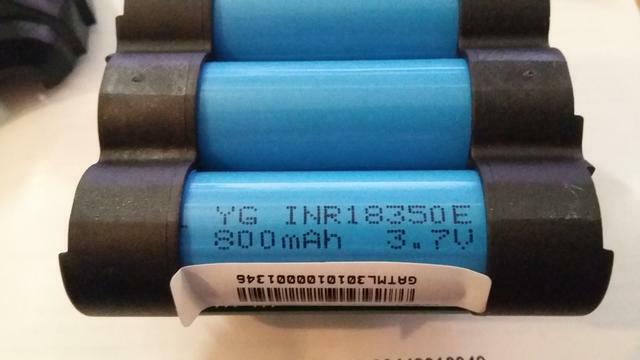 First thing I looked at was the battery. Capacity of 800mah is kind of low but 2 batteries in parallel could power a 2 motor feather easily, something akin to the minibots we ran at Robot Wars. 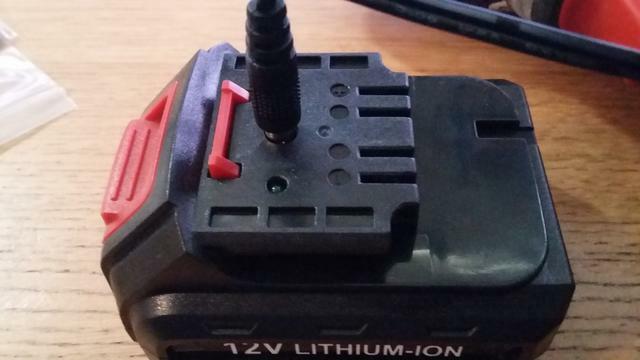 The above pic shows the charger attached, the charging and protection circuit seems to all be rolled into the battery. I'm assuming this is a cost saving thing (1 PCB in the battery vs 1 in the battery and another in the charger) but it also makes it quite handy and easy to use. I only had a quick glance but couldn't pull up anything on these particular cells but they seem uniform and neatly constructed. The circuit board can't be removed without desoldering, the solder and components on the circuit board looked of good quality. First thing I'll say is that this was easier to get into than the previous generation. 8 screws taken out the side. The reverse threaded screw came out with the aid of a square handled screwdriver and spanner (stubborn but no loctite). There are no screws holding the motor to the front of the drill. Fairly standard inside, about what we expect. 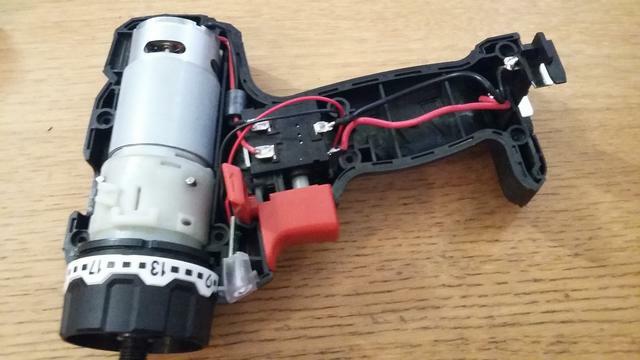 550 motor+gearbox, trigger, battery holder, light. A note on the light, it has it's own little PCB attached to the LED, it's clearly laid out for something like a circuit to keep the light on for a short time after release but is only populated with a resistor. 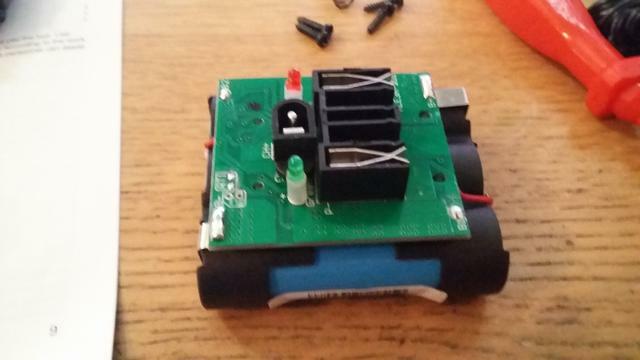 This does mean you could just cut the wires off the trigger, solder the PCB into a 12V bot and BAM! powerlight. The battery clip could be sawn off but I found it actually sits fairly firmly in the battery even without the part that clips onto the batterys sprung catch. If you didn't feel like having half a sawn off bit of drill in the bot a small bit of 3d printing could easily fill the spot. The meat of it, why you purchased the drill (unless you really like collecting passive aggressive instructions). The unit weighs 430g, which is 30g less than before. Length wise the shaft protruding from the end is ~9mm shorter (less chance to bend it). The threaded part is the same length and still fit 3/8" UNF brake fittings. 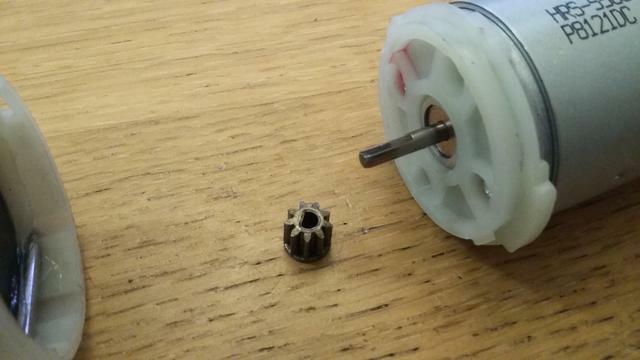 The provided reverse thread screw is the same size bot slightly shorter. Overall length of the unit is about 5mm less. A big bearing supports the output shaft right on the edge of the gearbox. The gearbox is a standard 2 stage planetary. The pinion is the same size on both new and old but the new has a smaller ring gear. This means a smaller ratio. Dropping from 36:1 to 28.44:1 (A 25% speed increase), this is actually a fairly good change, it'll mean less torque (more reliable) through the box and a bit more speed from your bot. All metal gears running through the gearbox aswell. 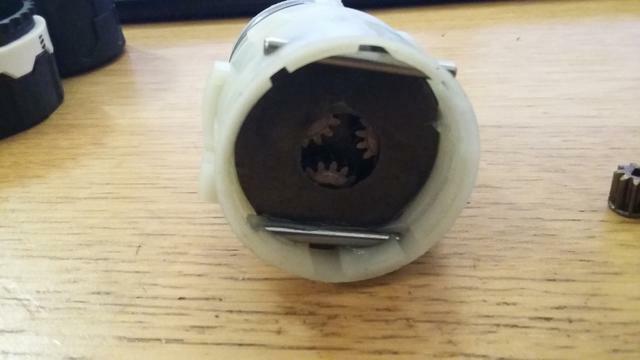 2 pins hold the gears in when disconnected from the motor. Unfortunately the gearbox and the plate attached to the motor are the twist together variety, this means without the drill case the motor can rotate and pull off. Fortunately there's a lot of handy tabs and mounts to use to lock them from rotating (Give me a few days to design you mounts). A quick check of the winding resistance tells me that while there are some minor changes to the 550 motors exterior it's basically same as always inside. The exterior difference is simply 2 notches on the rear of the motor. 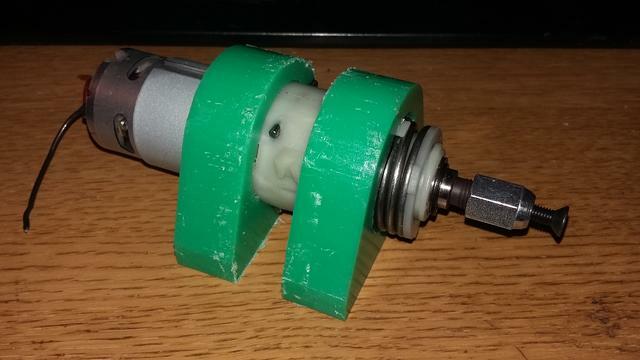 Could be useful to prevent it turning. The motor itself has a D shaft (Huzzah!). 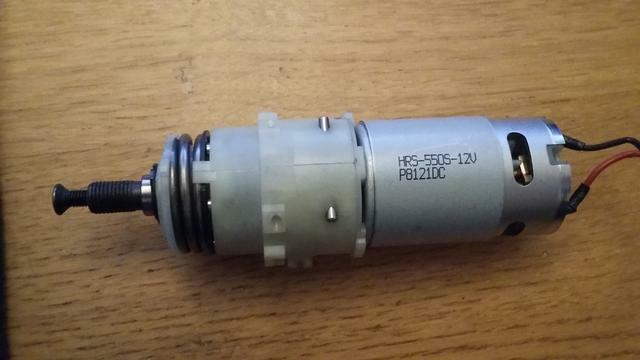 The motor itself is a HRS-550S-12v, I believe Gimson Robotics sell these. Clutch, this bit's interesting. The clutch is fully attached to the gearbox housing unlike before. Meaning it is still functional out the case. It's a standard spring clutch with ball bearings pushing into the ring gear which is notched. The front plate that sets the torque is on a thread around the end of the gearbox. It's on pretty snug and doesn't seem likely to come off in battle. I dare say you don't need to do the grub screw locking of this box. Maybe lock it for your own piece of mind but the ability to control the torque limiter rather than having it fully locked always could help add some reliability. As sortof mentioned the previous grub screw locking will work on this unit. Tightening the clutch out the case can reach the point of being able to stall the motor. 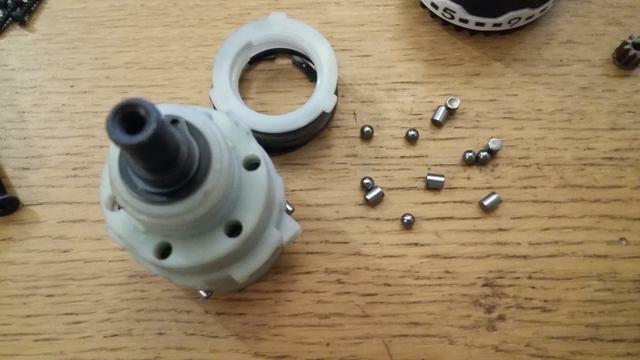 Keep the torque adjusting ring from the case, it's handy for turning the plate on the gearbox. Lighter, Faster, Option to keep clutch, More robust, Usable batteries, Free Power Light, Overall higher quality, All metal gears. Cons: Twist off style gearbox needs a more complex mount to lock it (Or wrap it in duct tape *shrug*). For the £5 increase you're getting a for the most part better unit. And to a newcomer buying 2 drills get's them useable batteries and power lights aswell. I've been impressed with the quality and once I design something to stop the gearbox twisting apart it'll be a very nice unit to use. The speed increase is very nice and welcome as is the option to retain the clutch. As a side note, it'd actually probably be decent as a drill. Working on some motor mounts to make these super easy to use, coming soon! How are those drill motor mounts coming along? Am looking to design my own custom ones, for my bot from metal and wondered if you found any snags or things to note? Roboteernat wrote: How are those drill motor mounts coming along? My mount design is all finalised and known to work. Nothing to really note, just fairly standard all around.